Membership Moment: If you like it, they will too! To continue last month’s idea on how to reach potential new members I want to go in depth on ideas for "Membership Drive" events. We want to encourage people who are a good fit for our Grange to become members, The best membership drive varies from community to community. Does your Grange have members who work in farming? Do you live near a town or city with citizens in need of clothes, food or free entertainment? Are you near a college or have community members who like to learn? Arts? Pets/Animal care? Gardening? A Membership Drive can really just be a layer of preparation that goes over an existing event. Usually we have a dinner or festival and we all socialize with friends but maybe we can still do that but work together to get contact information and learn more about our potential new members and friends. To plan for a Membership Drive you will want to plan not only the event but also by what means will you promote the event and collect information of the attendees so that you can follow up and invite them to attend a meeting. The best way to collect information on attendees can happen in a few ways. You can have a raffle. Do you quilt, bake, crochet or needlework and could there be an item like that raffled? In the description of the item and the raffle rules you could include who the artist is and whether you are willing to offer a class on that skill. Things to collect in the raffle would be name, email, phone and address. After the raffle, write and mail/email something short and sweet thanking those that did not win for their attendance and tell about upcoming events and meetings, People could ask about learning one of your skills (as demonstrated by the raffle item) and you can have a sign up for those interested in learning. A small version of the craft is a good starting point to teach from and everyone in the Grange who likes that skill can come along. This second visit of a potential member to the Grange is more intimate and they can see they can fit in quite easily. Do your Grangers like to read? Partner with the local library and offer your space for meetings of the book club. The potential members will get a chance to see what it looks where you meet and ask questions. 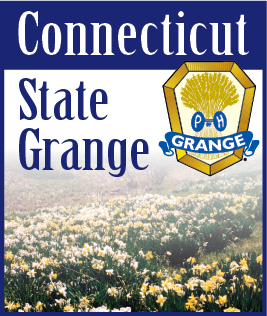 You can give them materials and an explanation of what the Grange means to you. The key to success with any event is to advertise. You can follow the regular plan with flyers and posters but also start exercising the reach you may have by advertising online and sharing and asking more people to share the message. I spoke about Facebook previously. You can create an event using Facebook and people have the opportunity to check whether they may attend. There are other social media tricks but Facebook seems to be what most are comfortable with. I will be reaching out to a few Granges who have interest in working with me to create an event. If you would like to brainstorm some ideas and give them a try I am available by email or cell phone.